Fall is coming to the park. the last of the perennials are blooming. Canada geese are headed south. A blurry hummingbird is having a snack - I wonder if they migrate south too. The maple leaves are turning red on some of the trees. Squirrels are active - hoarding acorns and any food they can find. A big ol' fungus sticking out of the ground. A big ol' plane flying overhead. An American Goldfinch eating the coneflower seeds. Bright colours before everything turns cool and brown. Another big plane flying overhead. I'm getting awfully artsy with these shots. James like to concentrate on things. And the leaves - I carry him past low hanging branches and he grabs for the leaves. 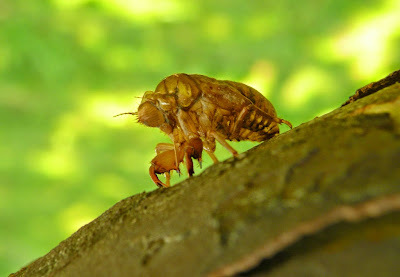 Cicadas have emerged from their carapaces and sung their last songs of the year. They're still about, in a way. At one point, a Spitfire flew overhead. Seriously. A Spitfire. James concentrated on the ground. The ground caused him to giggle. He thought long and hard. He is going to enjoy nature, I hope.